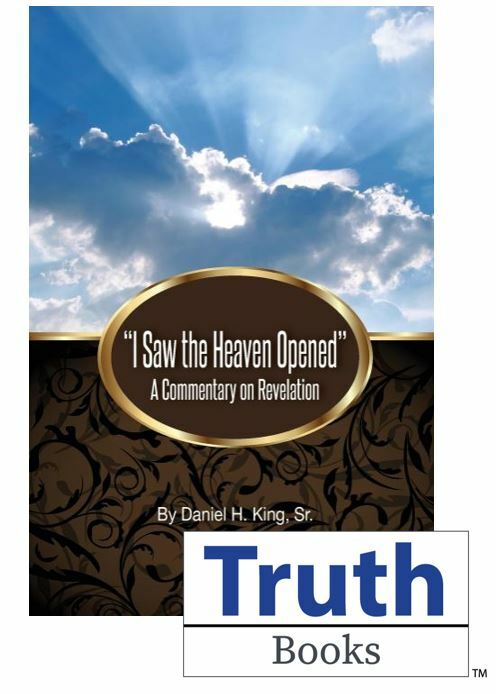 Daniel H. King, Sr., the author of several commentaries in the Truth Commentaries series, brings a new and fresh look at the closing book of the New Testament—the book of Revelation. In “I Saw the Heaven Opened”: A Commentary on Revelation, Dan offers a thematic approach to John’s Apocalypse that provides a valuable resource to any student of Scripture. In its extensive introduction the reader explores what we know about the books author, where and when it was written, to whom it was written, and how to understand the symbols within this strange and mysterious book. Chapters one and two consider the letters to the seven churches of Asia. Chapter three considers the first of seven cycles King identifies in the book: The Seal Sequence (4:1-8:1). Chapter four addresses the second cycle: The Trumpet Sequence (8:2-11:19). Chapter five examines the third cycle, which King labels the Beast Sequence (12:1-14:20). Chapter six discusses the fourth cycle: The Bowl Sequence (15:1-16:21). Chapter seven presents the fifth cycle: The Judgment of the Harlot (17:1-19:21). Chapters eight and nine outline the sixth cycle: The Final Victory (20:1-15) and the seventh cycle: The Reward of the Faithful (21:1-22:5). The book concludes with chapter ten, addressing John’s epilogue to the book (22:6-21).